With these words Camille put a hopeful spin on a challenging aspect of her life right now, one that she described in our article of a few weeks ago: I Feel Abandoned. For many Baby Boomers, the holidays are a sad time rather than a time to celebrate. At 70+, a number of Camille’s friends are widows. Parents and, in some cases, friends and siblings have passed away. Some do not have children, others have children but they live far away. 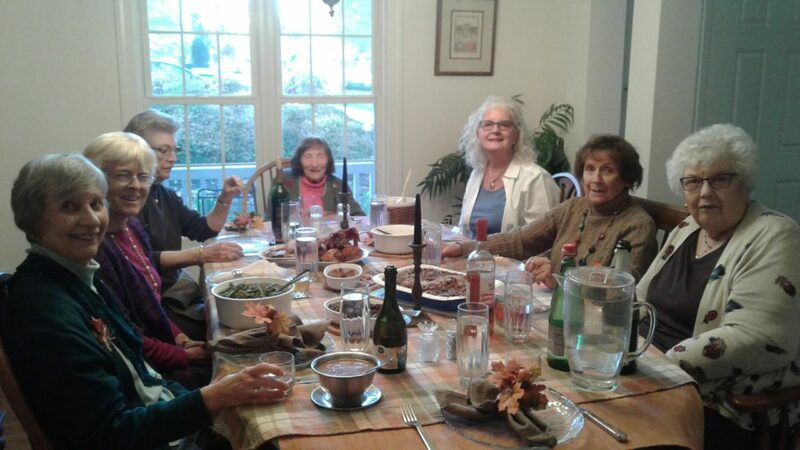 When I see the photos of Camille’s “FriendsGiving” however, I see a new reason for hope and happiness at the holidays, if we just reach out and gather our friends and acquaintances together. Boomers shared so many common experiences and challenges over our lifetime, and came up with answers and solutions. We are an innovative generation. FriendsGiving is one such solution. 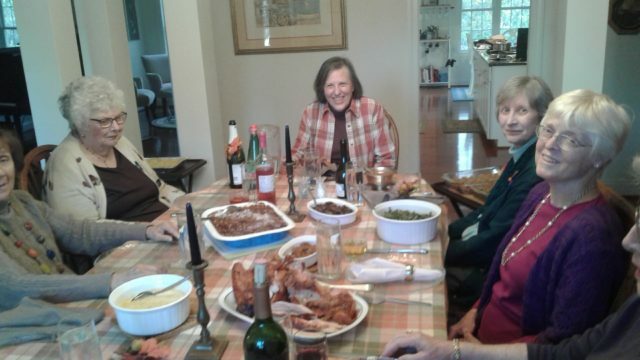 Just last year, Camille’s mother, aged 95, sat at the head of the Thanksgiving table, as lively and engaging as ever. She passed in January. A loss so fresh, the first holiday season without her mother, has really hit Camille hard. 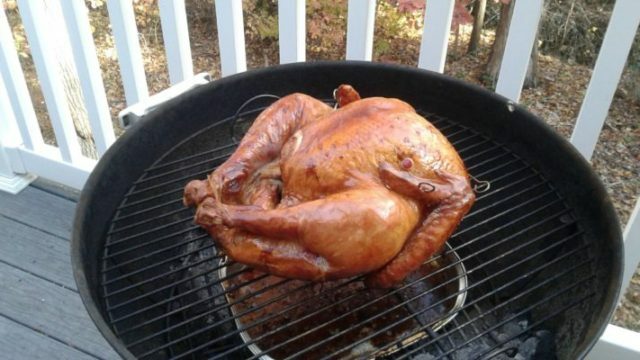 The week prior to Thanksgiving she felt bowed down with sadness. In addition to losing her mom, her only surviving sibling, a sister, had gone to Texas to help her own daughter whose husband was battling cancer. “I spent an entire day in bed. I felt overwhelmed.” But then she snapped out of it and went shopping for a Thanksgiving turkey. Camille remembered happier days of her youth, growing up in a large Italian family in New York City, with all its wonderful traditions and wonderful food.As an aside, I was curious as to what her Italian Thanksgiving food traditions were all about, as my Pennsylvania Dutch ones were surely very different. Camille described stuffed mushrooms and stuffed artichokes (definitely not on my family’s menu. Artichokes?) Yes on the turkey, gravy, (sausage) stuffing, and mashed sweet potatoes. No on the pumpkin pie. In NYC they had special Italian pastries for dessert, and nuts still in their shells that you had to crack with a nutcracker. She noted that in the early years the meal started with traditional Italian antipasti but her mom had to suspend this particular offering, as no one would then be able to eat the dinner afterward!! The meal would last for hours. In between courses, the women cleaned up for the next round and the men would rest, as the kids played games. The youngest of the group family around the table was 69, the oldest 89. There was lots of laughter, lots of good stories. 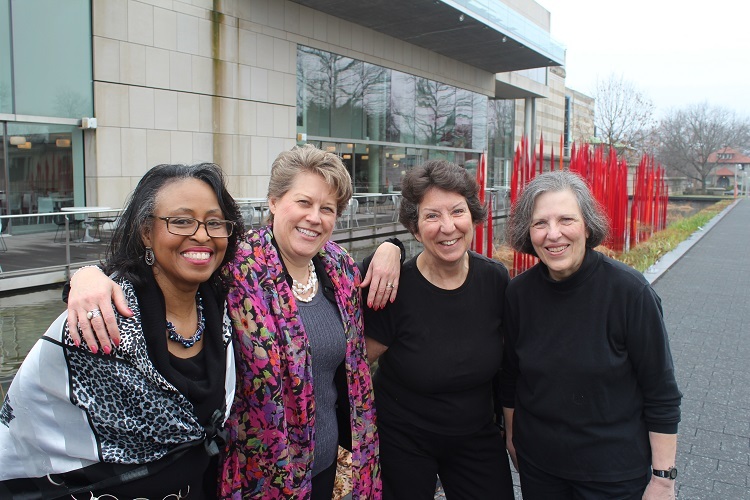 One of the ladies has been to every continent (yes, including Antarctica) and every state. She is a single woman, always has been, but that did not stop her from seeing the world. 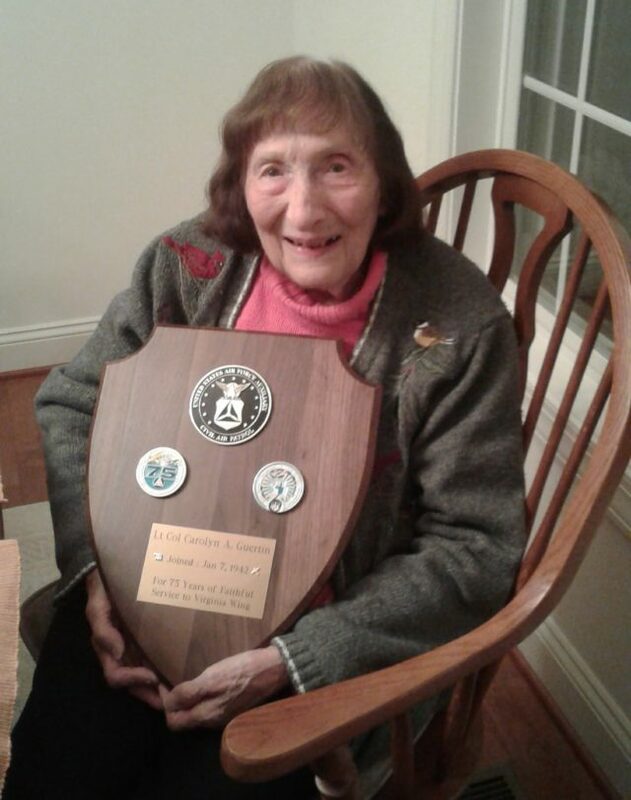 Carolyn Guertin with an award for 75 years of service with the Civilian Air Patrol. The oldest of the group is an amazing lady named Carolyn Guertin, who shared stories about 75 years of service with the Civil Air Patrol. She is a Lt Col. US Air Force Auxiliary, Virginia Wing, joined Jan 7, 1942. She is 89 so if you do the math, she joined at 14!! She flew planes during WWII, transport and search and rescue, as she was not allowed in combat. She continued serving throughout her life, and parachuted out a plane just a few years ago! Incredible, right? Next year I want an invitation to Camille’s Thanksgiving celebration!